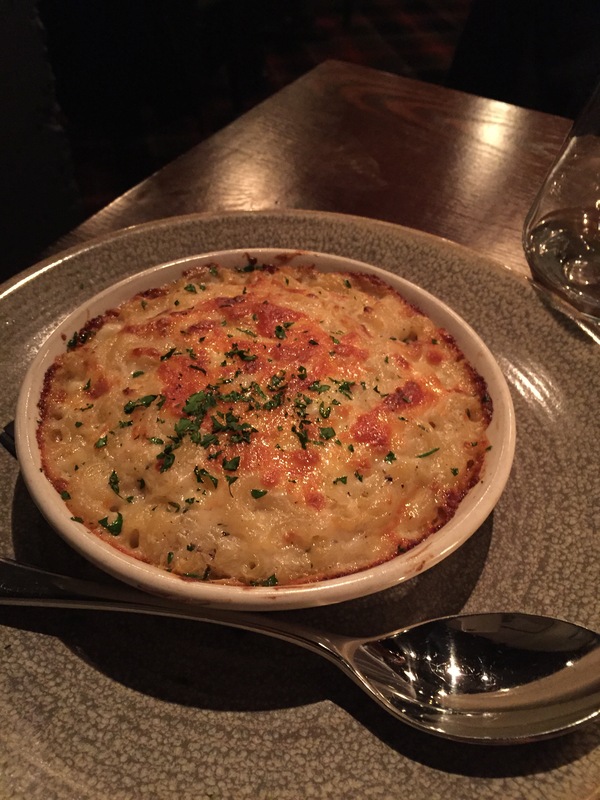 Standout dishes – Risotto Cakes & Hogget and lush cocktails! 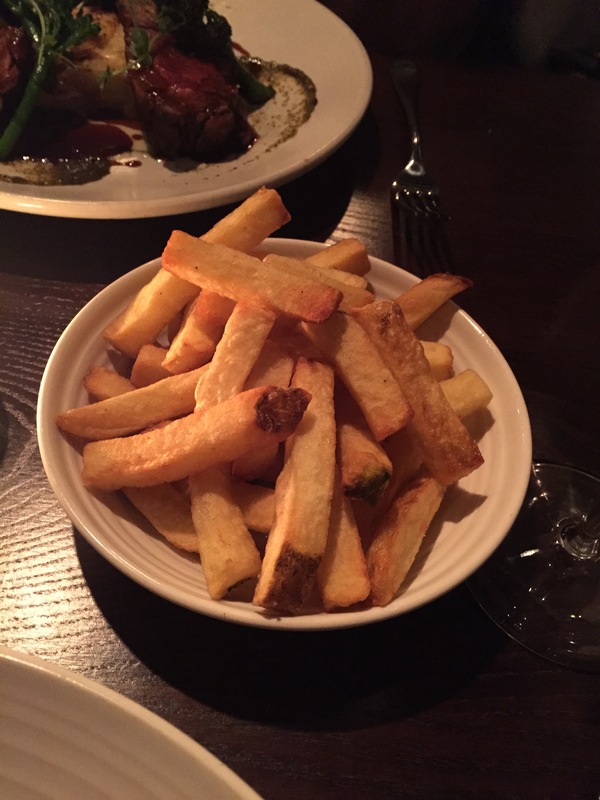 I’d had a long and busy week at work and it was a really, really cold Thursday evening when I headed across town from Hammersmith to Shoreditch to visit a restaurant I had wanted to check out for quite a while. The Jones Family Project is a family-run establishment located in Shoreditch on Great Eastern Street, close to Old Street station. Before we sat down for our meal we got to meet Anna who along with head chef Cristiano Caputo, Duncan and Amit are the brains behind the Jones Family Project. They were also the people who were involved with setting up a bar I used to frequent in my youth a lot! The Pitcher and Piano chain is well-known to many people and it was great to know they were part of being behind the amazing Nottingham (my home town) location too. Duncan bought the building for Pitcher & Piano in 1997. It opened in 1998. He loved the building and the area. The site is a deconsecrated church. It was being used as a lace museum at the time. Amit was in charge of finding the right team to run it and the opening. 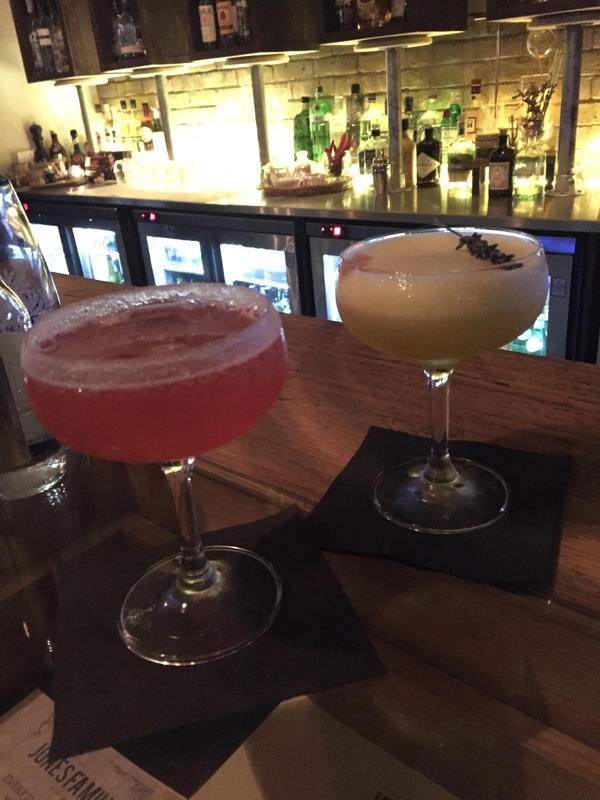 It was great to hear this history about a place from my hometown, as I sat sipping a lush, fruity, sweet hibiscus champagne cocktail in the heart of my new-town London. 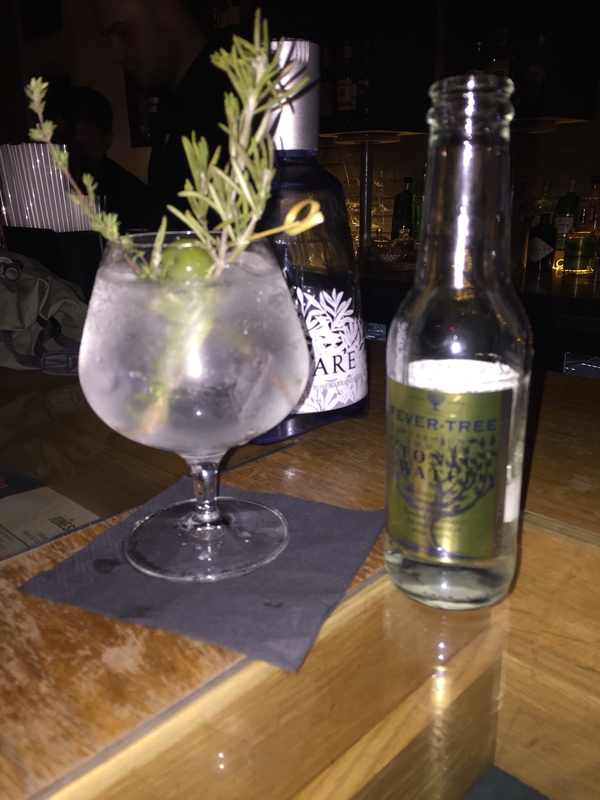 My guest is a Gin enthusiast and opted for a Mediterranean concoction suggested by talented bartender Patrick called Gin Mare made with Rosemary and Olives. I tasted the Saffron Sour that Anna had ordered and it was creamy, fruity and a really interesting combination of flavours with the Saffron, orange and egg white. The restaurant tries to serve as much locally sourced produce as possible, for example their tea comes from www.joesteacompany.com and their pork comes from local butcher Ginger Pig. We were then shown to our table by a really friendly waiter called David who was attentive yet gave us space and suggested some great dishes and a really nice bottle of house red for us. 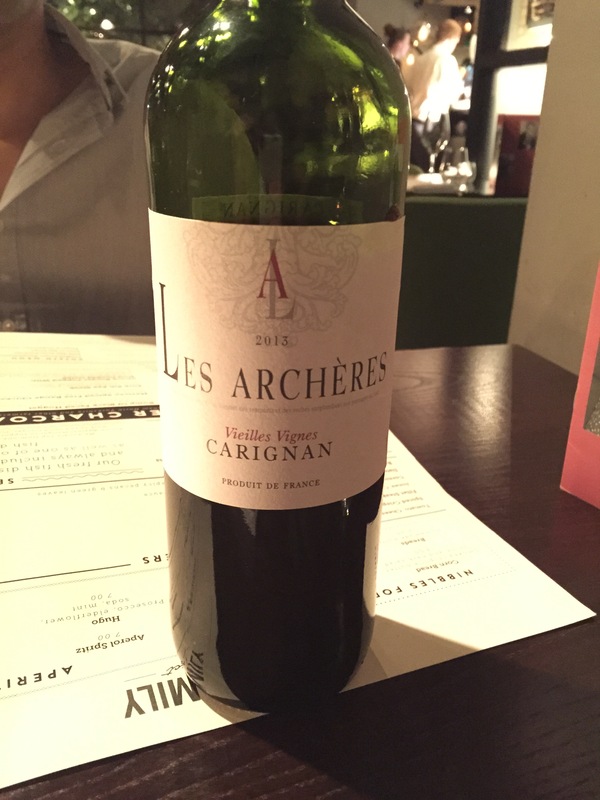 Carignan Vieilles Vignes les Archeres, a Spanish wine which was aromatic and a nice, light complement to the meal. 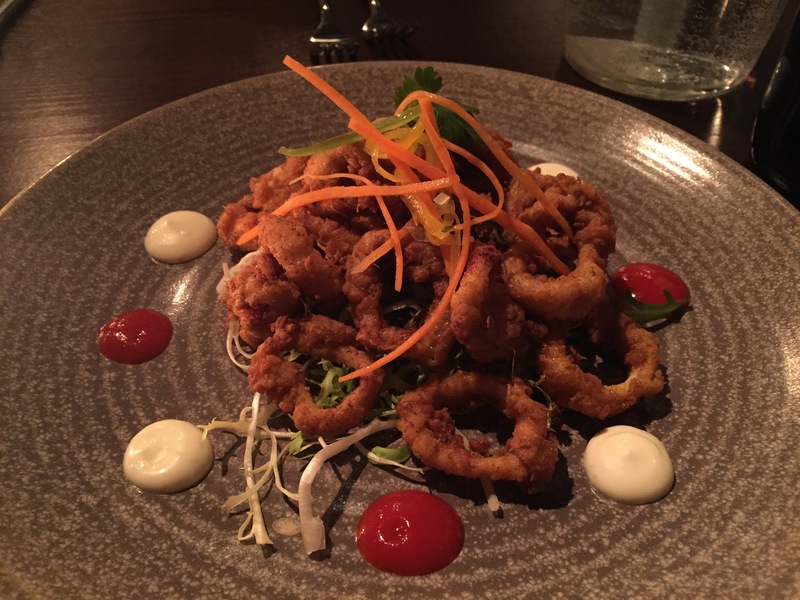 For starters my guest and I ordered the Spiced Crispy Squid which had a light spicy kick, chewy, tender with a nice and light batter. It was served with a selection of sauces. 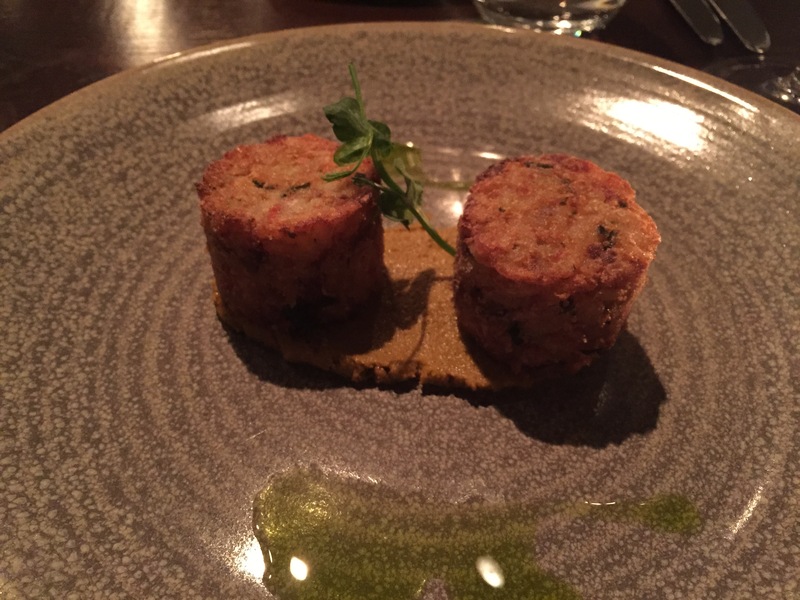 We also ordered the Risotto Cakes which was a great take on the Arancini balls you find in Italian restaurants. They were well-presented, nicely flavoured, had a light crunch and served with a tapenade and olive oil dressing. Then we moved onto the mains. I ordered one of the specials for the night. 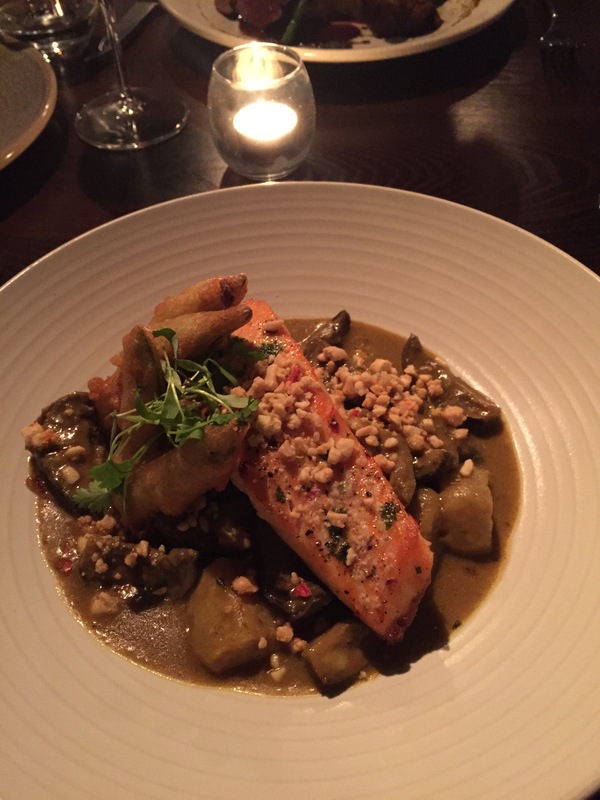 It was Thai-style salmon served with coconut and galangal sauce, baby aubergines and sweet kunega potatoes. The salmon was cooked just the way I liked it being tender and flaky, crispy on the outside, saucy, full of flavour and topped with nuts. 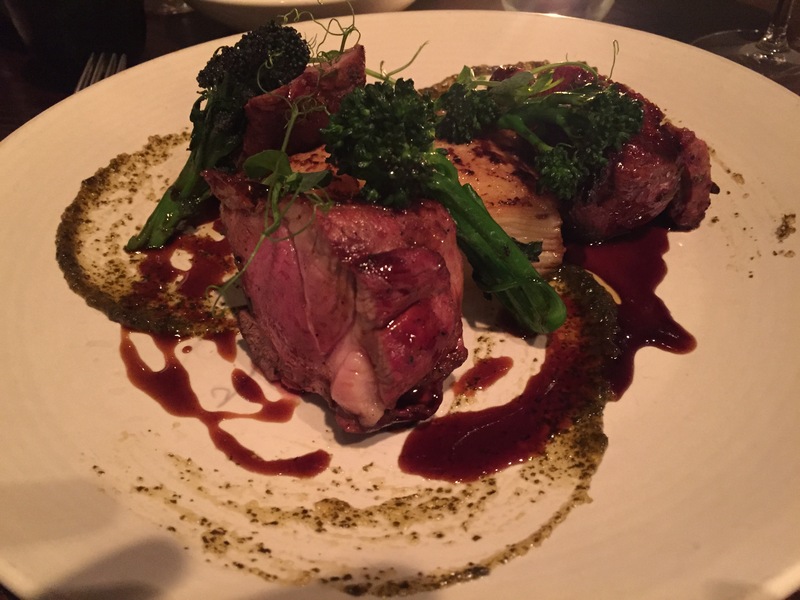 My guest ordered the Rump of Black Faced Hogget which was cooked medium-rare. It was presented incredibly well, with a crisp outside and tender meat on the inside. It was an amazing sauce and lovely dauphinoise potatoes. Both mains had generous portion sizes so we had happy tummies at the end of the main meals! To accompany the meals we had a creamy and comforting mac ‘n’ cheese and some big chips. We were pretty full from the starters and main so just shared a dessert between us. We ordered the Langley’s Gin & Orange Semi-Freddo which was served with orange and crushed meringues. 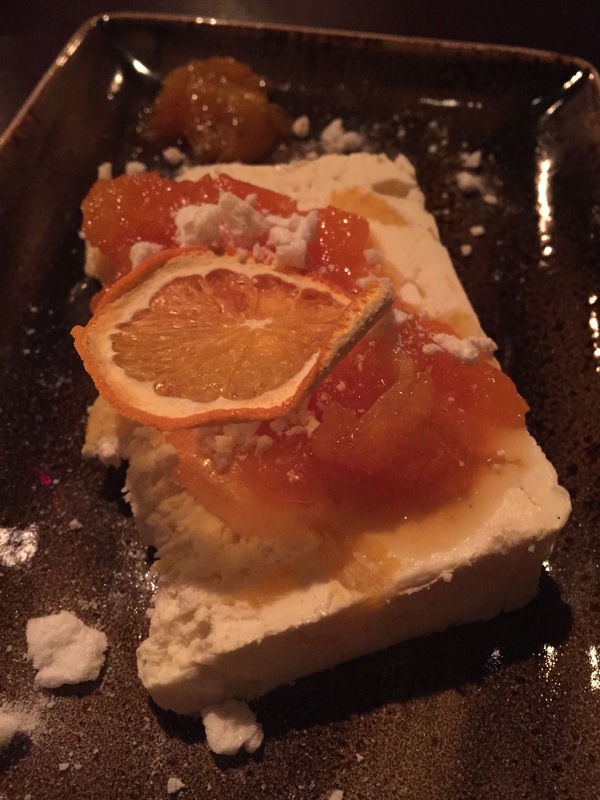 The dessert was obviously orangey, creamy, fresh, tangy, luxurious and extremely well-presented. Overall, The Jones Family Project is a really happy and vibrant place to be. The ambience is sophisticated yet funky, young yet you can still go for a family meal. A great date place or just for girlie cocktails. The food speaks for itself being wholesome, delicious and unique. Being located where it is opposite the Hoxton Hotel it is likely to attract diners from far and wide. I look forward to visiting the Jones Family Project more in the future, especially to try the British Pud’s and wish it lots of success!